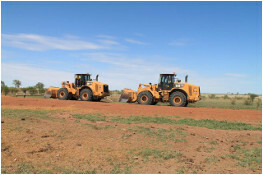 Norwest Plant & Pastoral Pty Ltd is a privately owned earthmoving services company, directed by Don and Kim Kidd. Based in North West Queensland but with the ability to move interstate, Norwest offers Australia-wide earthmoving services. Norwest was established in 1996 with a mine contract near Charter Towers. Over the past 18 years Norwest has expanded into rural and civil earthworks, establishing itself as the earthmoving contractor of choice in the North West and Gulf Region. We are passionate about regional industry, specialising in and particularly enjoying remote work, while priding ourselves on our flexibility and willingness to accommodate a variety of work in a range of locations. Norwest earthmoving services are available on an hourly, daily, weekly or contract basis. Our growth and success is credited to a team with ample experience in all major fields of earthmoving, demonstrated commitment to best practice policies and procedures, and a love for remote work. We invest in the latest technology and maintain our fleet – while being able to improvise and get the job done when required. Norwest plans to continue its steady growth in the earthmoving field, so as to remain competitive in all aspects of rural, civil and mining earthworks, and meet the evolving needs of clients. Recently, we’ve added a new dimension to our business; Beard Crescent Workers’ Camp. 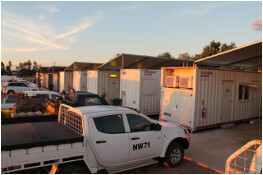 Offering workers’ accommodation in Normanton and North West Queensland, the camp is modern, practical and relocatable! As Normanton is a small cattle town and the region itself is quite remote, accommodation in the area is sparse during the tourist season, making Beard Crescent Workers’ Camp a welcomed relief for those seeking workers’ accommodation when in the area on business. Beard Crescent Workers’ Camp is conveniently located just 500 metres from Normanton Airport, can accommodate up to 29 lodgers and has three on-site staff, including a cook. However, the camp can be relocated in part or full, depending on client needs. Beard Crescent Workers’ Camp is strictly workers accommodation and is available to any company, client, government body or individual contractor/worker on short and long term hire. For more information, please see our accommodation page.